Oh how I wanted to finish this project before the end of December. Shockingly, that didn’t happen. The new goal is to finish this before the Story Time Sampler is released later this month. That much I can do, assuming I don’t waste the weekends between now and then. Let’s check in with Once Upon a Time, where Cinderella’s Fairy Godmother has bippity-boppity-booed the pumpkin carriage into existence. October in January? Just roll with it. But whatever. I’m here now, and I have updates. April or May or whenever was a while ago. Now that I’m uploading all the pictures, it occurs to me I might not want to cram all of this into one post, but if I don’t I’ll just give up and figure I can write this thing another day. Not sure if we’re in a rut or a vicious cycle, but I’m not going to analyze it too closely. I’m also going to tackle some of the WIPocalypse questions I missed, but for now let’s talk about the stitching progress. Finishes first. Hold onto your hats. 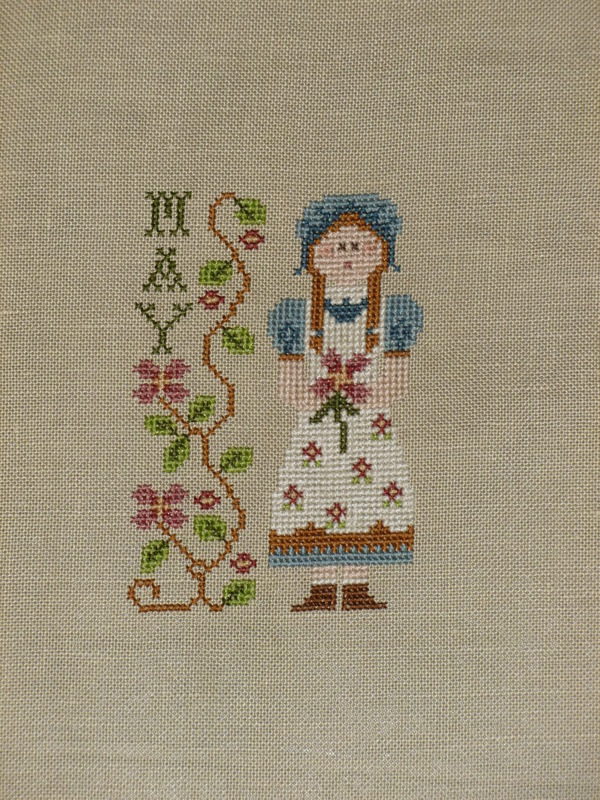 Here’s the May Calendar Girl from Little House Needleworks. I have the rest of them, but I second guessed myself as to how I want to finish them. They’ll sit for a minute until I figure it out. Since I already have 3 finished, I’ll most likely keep stitching each one separately just so I don’t have to redo them. I have enough other pieces languishing in the stash that I’m not really in a hurry. They’re cute, but I just don’t know what I want to do with them. I really like this one, and I had my eye on it for a while. 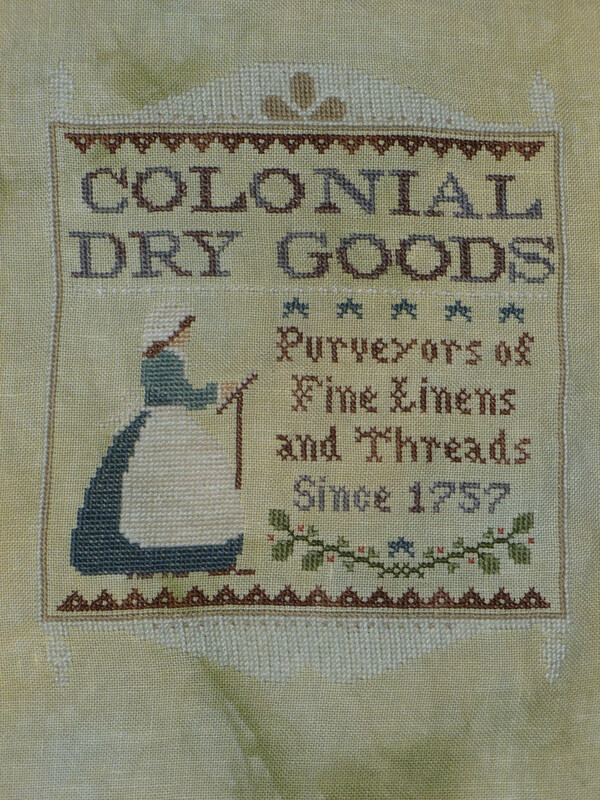 This is Colonial Dry Goods, also by Little House Needleworks, finished 5/23. Fun fact, that blue is actually green. At least, it’s called green, which really threw me for a loop. The left side looks a little weird because I don’t stitch on a hoop and haven’t stretched it out for framing yet. I’ve been waiting until I have more things to frame because I’m cheap and don’t like to pay for shipping. It happens. The lettering at the top is a Classic Colorworks floss called Rod and Reel, and it’s one of the best overdyed flosses I’ve used. Everything else is just variation within the same color, which is subtle. This one is a little more in your face. The picture doesn’t do this one justice. The lighting in my kitchen really messed with the various shades of pink. Maybe it’s just me, but in this picture the pinks look a little purple when in reality they are definitely pink. But I’m getting ahead of myself. 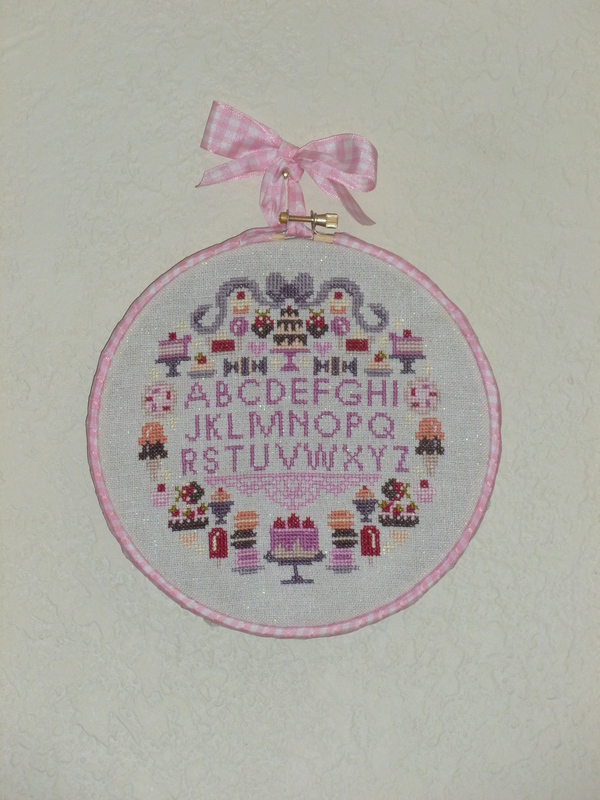 This is Sugar Is Sweet by the Frosted Pumpkin Stitchery. I could have sworn they said they were doing either 4 or 5 alphabet samplers this year with a similar layout, but so far there’s only been one other than this. Oh well. The ribbon is just wrapped around the outer part of the hoop. The fabric isn’t mounted in the hoop very well. There’s no glue involved, just a drawstring type situation in the back, so I’ll probably take it down and fix the mount at some point. This is A Full Heart, the first part of the 2014 Shepherd’s Fold by Shepherd’s Bush. This is the first pattern of theirs I’ve done, and I admit it was harder than I expected. I’m still not sure why. 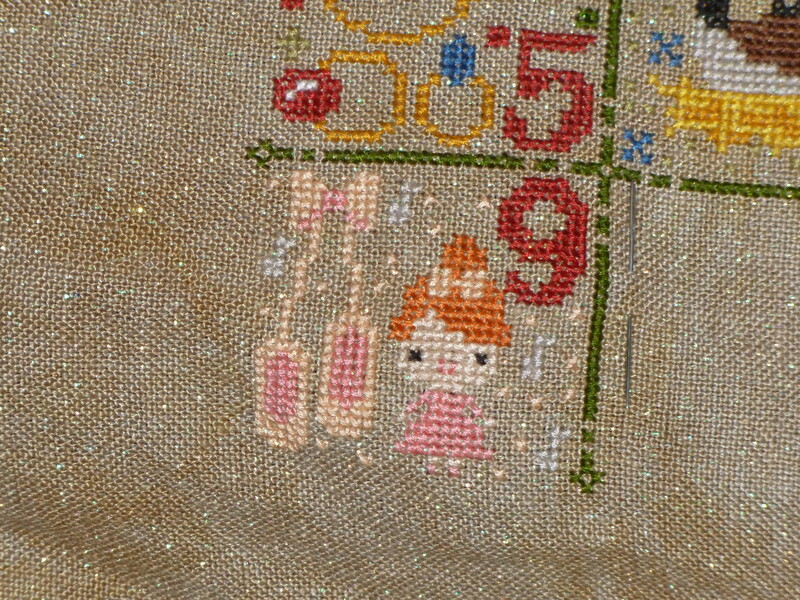 The beads and specialty stitches weren’t particularly hard, and it’s only 32 ct fabric. Maybe the silk was throwing me for a loop. I don’t know. 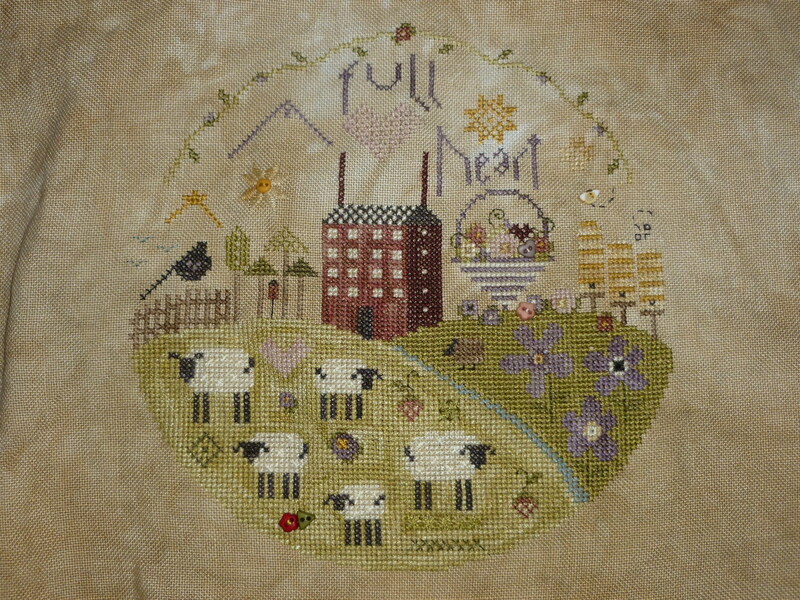 I love looking at this piece now that’s it’s finished and I would certainly do it again if I went back in time, but it was a relief when I reached the end. 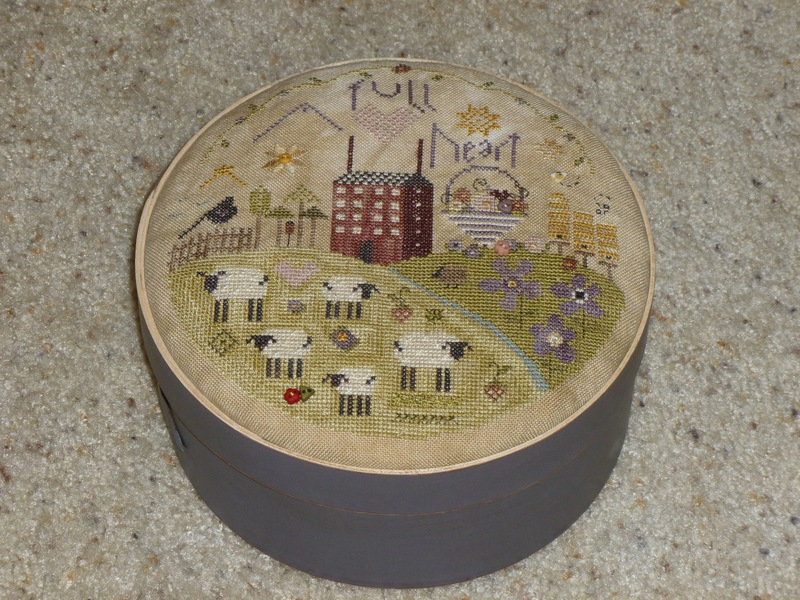 This piece was designed as a box topper for a sewing box. Yes, I splurged and got the box. Up until now my notions have been a little out of control (and would often turn up in strange places), so it’s definitely handy to have the box. Here’s My Home, a scissor fob and the second part of the Shepherd’s Fold. I admit I don’t know the purpose of a fob. The stitching wasn’t a problem, but the finishing was surprisingly difficult. I followed the instructions in the kit, but it just kept looking worse and worse until I finally took it apart and tried again. The “correct” way was to sew it wrong side out, flip it the right way, stuff it, finish closing it, then attach the ribbon. Mine looked just awful. I ended up making a backstitch border around both sides and sewing the backstitches together, looping on the ribbon and beads as I went. Here’s the reverse side of the same piece. I’m two months behind. These blocks go pretty quickly, so that’s not so bad. Here’s what the whole thing looks like right now. Some dragons for good measure. And a mermaid who is not named Ariel but has a Disneyfied sense of fashion. Honestly? This makes me pretty uncomfortable. Cloudsfactory is expanding into more original designs, but a lot of her patterns use trademarked characters. 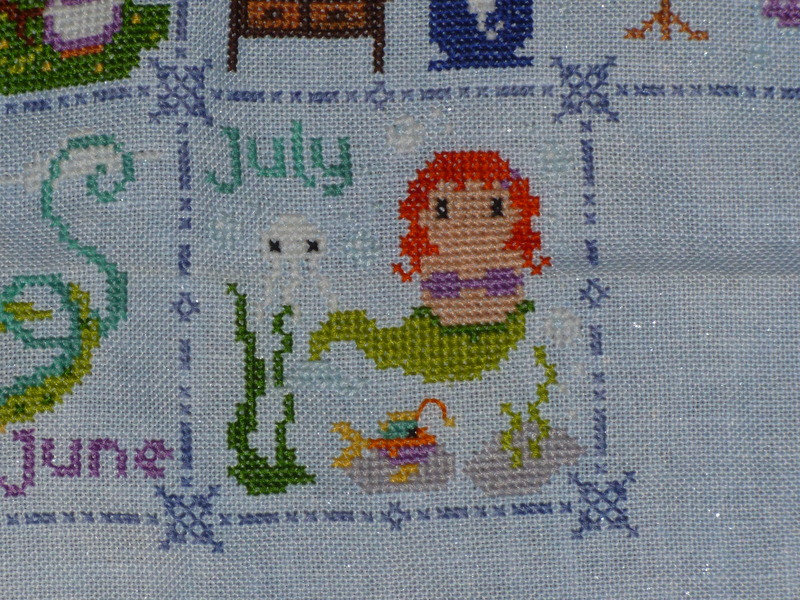 I bought this one because at first it had original characters and I figured it would stay that way, but the wizard and mermaid who look like Disney but with different names in the pattern… I’ll finish stitching this pattern, but that will probably be it for me for Cloudsfactory unless the company fully shifts away from trademarked characters. Now how about something new? 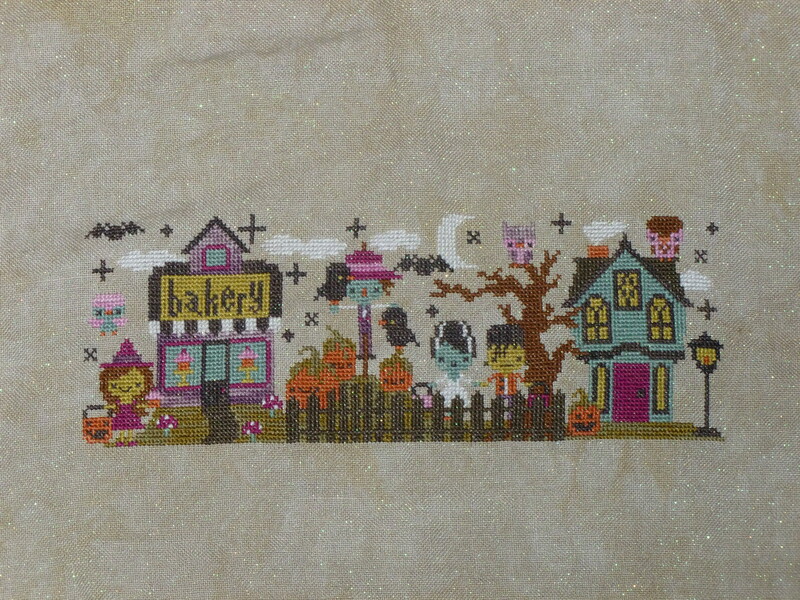 This is the Mysterious Halloween Town from Frosted Pumpkin Stitchery. It’s being released this fall in four parts. This is 1-3, with part 4 coming out later in September. I love that variegated purple on the bakery. 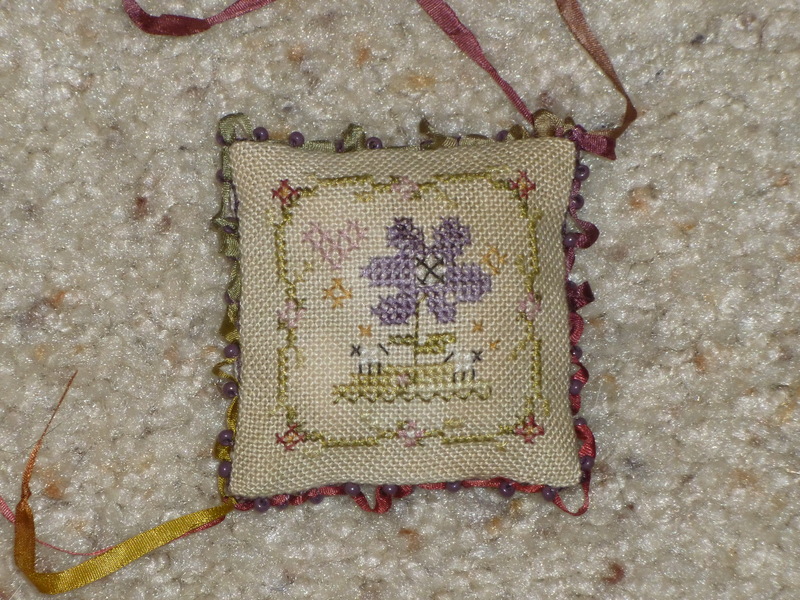 The individual parts of this were fairly quick to stitch. Part 4 will go along the bottom. I’m working on the SamSarah mystery sampler, but since they’ve asked folks not to post pictures until it’s over, I’ll hold off for now. I’m almost finished with the first part (for those who are doing the same pattern, I haven’t finished filling in that bit on the left, but everything else is done). The designer has sent out part 2, but the shop I’m using hasn’t gotten it yet. 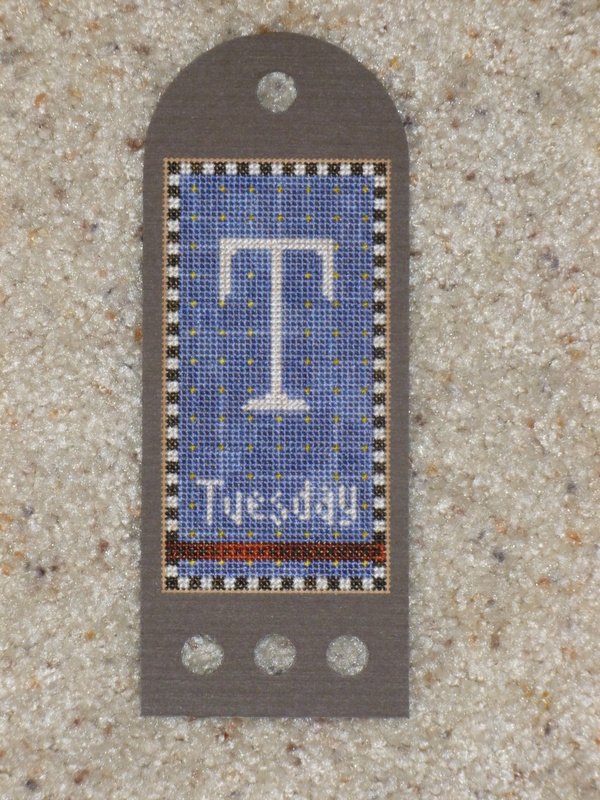 This is the first tag for the Fun Every Day perpetual calendar SamSarah put out a while back. I’m going to have to start over. The perforated paper is driving me nuts; I usually use the sewing method on linen, so this is just too slow for me. I’ve ordered a large enough piece of linen that I can stitch all the tags in hand, then trim them to size and glue them to the paper tags. 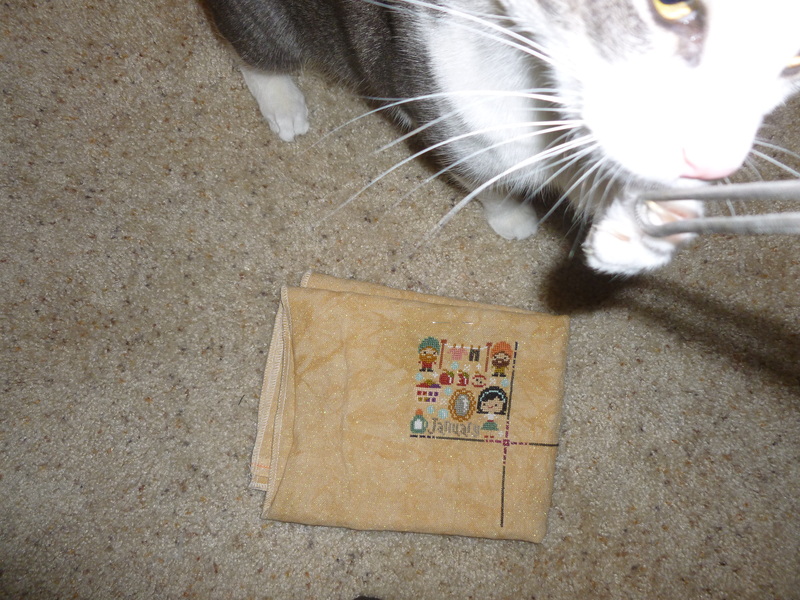 I do so hate to redo things, but perforated paper takes like three extra motions per stitch. Not cool. I’ve done some work on Quilty Stitches, but I can’t remember what I last posted about or how far I am right now, nor do I have any pictures of it handy. I guess we’ll come back to that one. Let’s look at some of the WIPocalypse questions I missed. May: What designs or themes do you really wish you could find? What do you think is missing among stitching designs? This one is a little hard for me to answer. I don’t generally look for specific themes, and it’s a little hard to pin down why something appeals to me. I tend to look at Americana and nautical first, but I generally choose pieces because I like the color scheme or the layout. A Full Heart doesn’t strike me as something I would like, but I do. I can’t explain it. So I don’t know what I wish I could find, because I have a hard time searching for something specific. I just kind of see things in passing and know I like them. June: Have you ever been to a stitch gathering such as a retreat or a festival? If so, tell us about it! July: It’s halfway to Christmas. Do you start your holiday stitching this early? If so, what do you hope to accomplish this year? I haven’t done any Christmas stitching yet. I certainly wasn’t doing any in July. Then again, I’m doing two Halloween patterns this year, which is not usual for me, so if I weren’t doing those I would probably start Christmas patterns. I have two so far this season; one is ready to go once I reach a stopping point with some of the Halloween stuff, and the other is waiting on fabric. 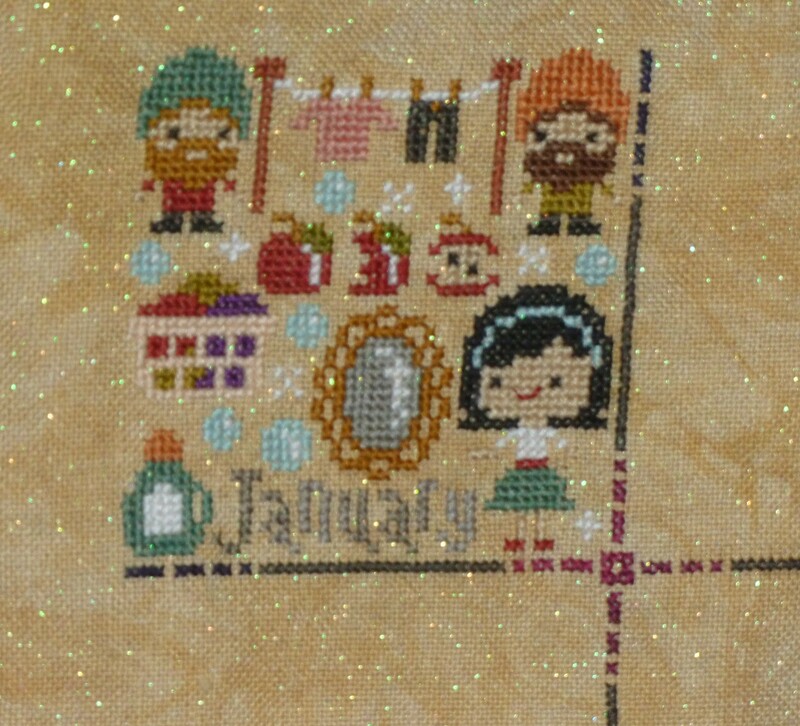 First of all, I’m pleased to note that, after a late start, I’ve finished the January block of Once Upon a Time. 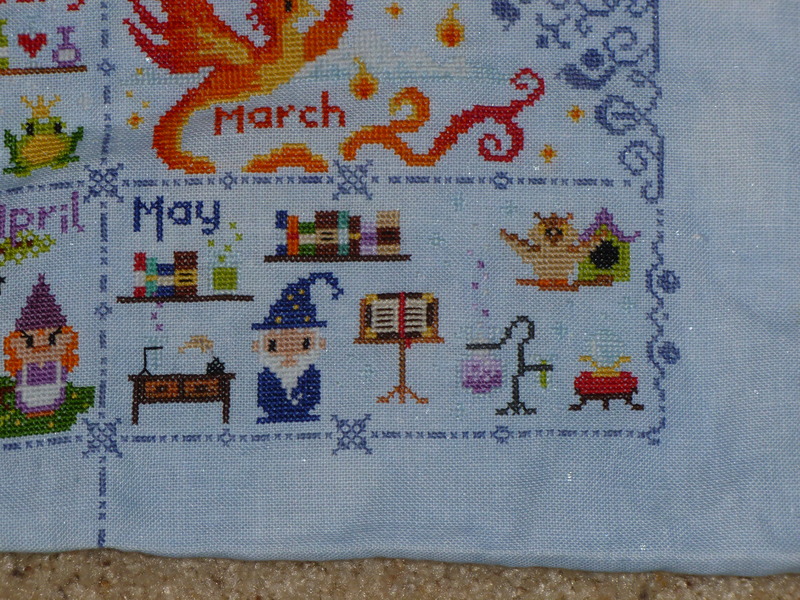 Even better, I finished it before the February block came out! January’s theme was Snow White. Don’t yet know February’s block, but the hint was that it’s very green. My money is on Jack and the Beanstalk. Not sure what’s going on with the left side of Snow’s mouth; the backstitch slid between the two threads underneath. Also, the entire time I was stitching the dwarves, I had the song from the Hobbit about blunting the knives and bending the forks stuck in my head. A few things to note: The fabric is Crystal Doubloon from Picture This Plus, hence all the sparklies. Yay, sparklies! 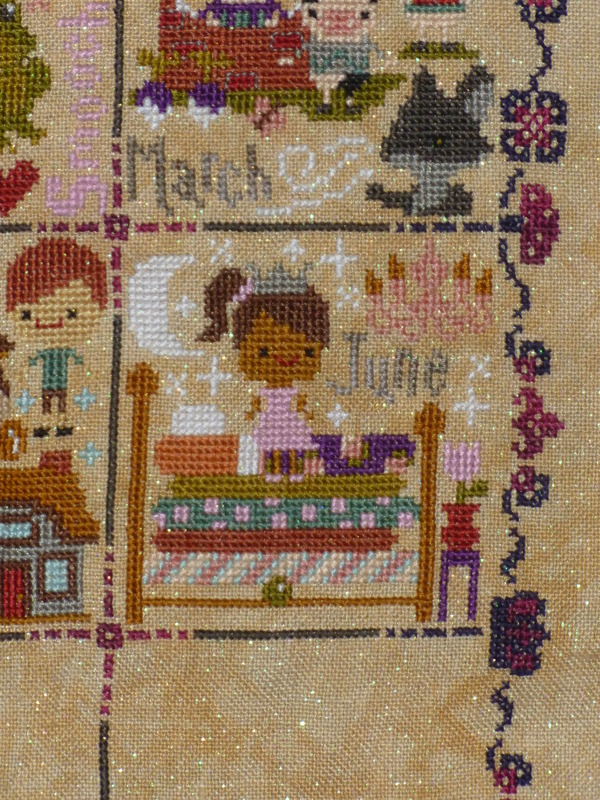 Next, take a look at the word “January” and the blackberry corner portion of the border. See how the color changes? In this picture it’s more noticeable in “January,” but in person the blending on the blackberry portion is really nifty, which was mostly random chance. These two sections were stitched with over-dyed floss from Weeks Dye Works, so there’s a natural and randomly spaced gradation in the thread. To really make the gradation pop, you need to stitch using the English method, where you stitch each X individually. I predominantly use the Danish method, where you’ll do a row of half stitches in one direction before going back in the other direction (here’s a better explanation of the difference, pictures and everything). In general, I don’t like the English method. For me, it takes longer, and it uses more floss. WDW is pricy floss. Kills me that you have to use more of it to get the full effect. Also, I had some assistance when I was taking that picture. The February block will be released in just a few hours! In the meantime, I had some time to kill so I moved on to another project. 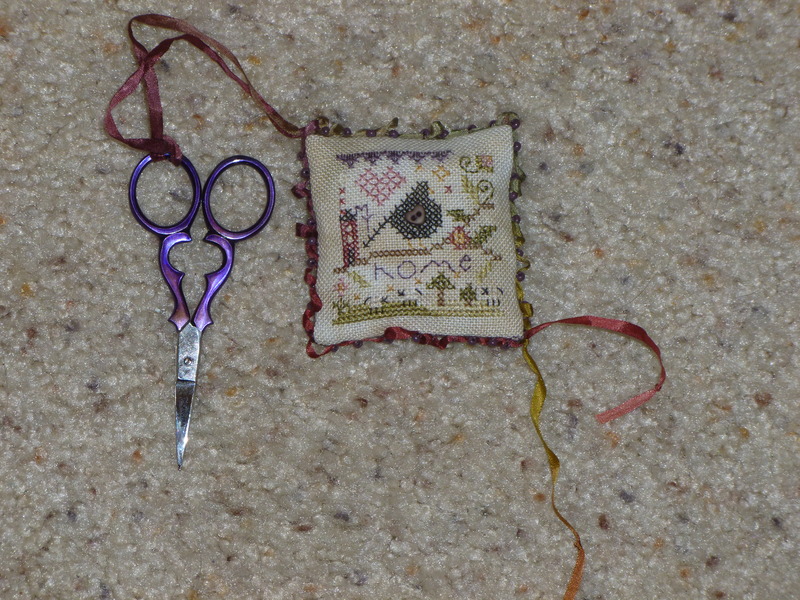 Little Miss Shabby is a quilting blog but is running a cross stitch “sampler along” called Quilty Stitches. The pattern is based on quilt blocks, with a new block released every two weeks and sixteen total blocks. I’m using a different color scheme, with deeper blues, greens, and reds. I’m using 28-count evenweave, I think in mushroom. I really like my color palette against the mushroom background, so I’m not going to fill in the white portion of the blocks. 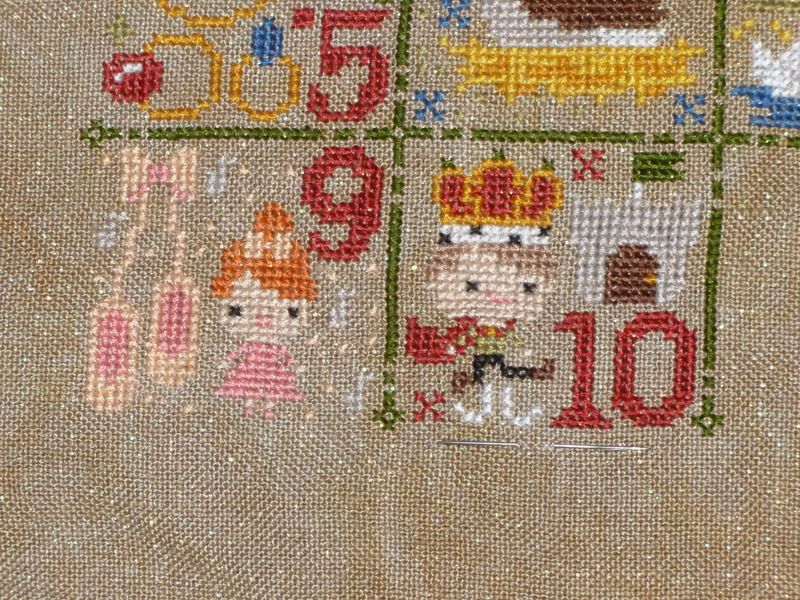 Instead I’m going to find a darker brown that compliments the mushroom and use that to fill in the border between blocks. 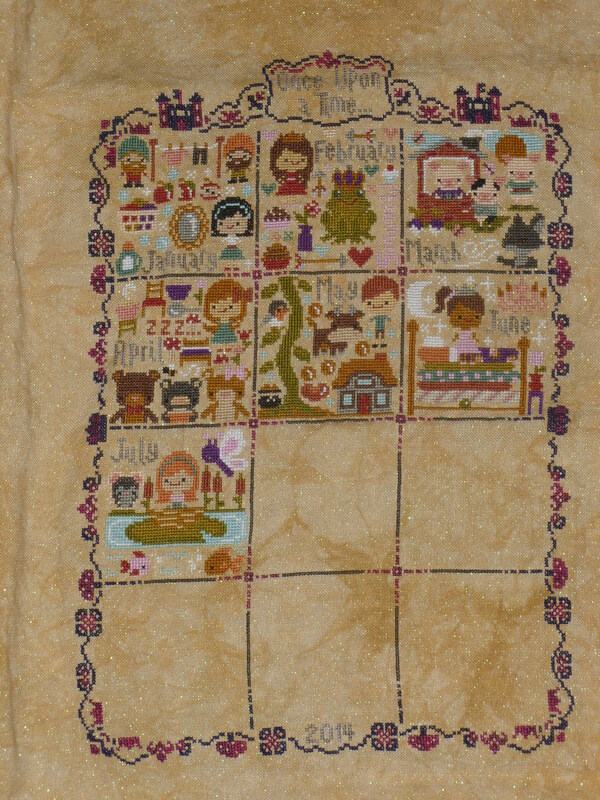 Here’s an index of all the relevant Quilty Stitches pages. My color palette is, on average, deeper and darker than the “official” palette. The pattern is pretty straightforward. 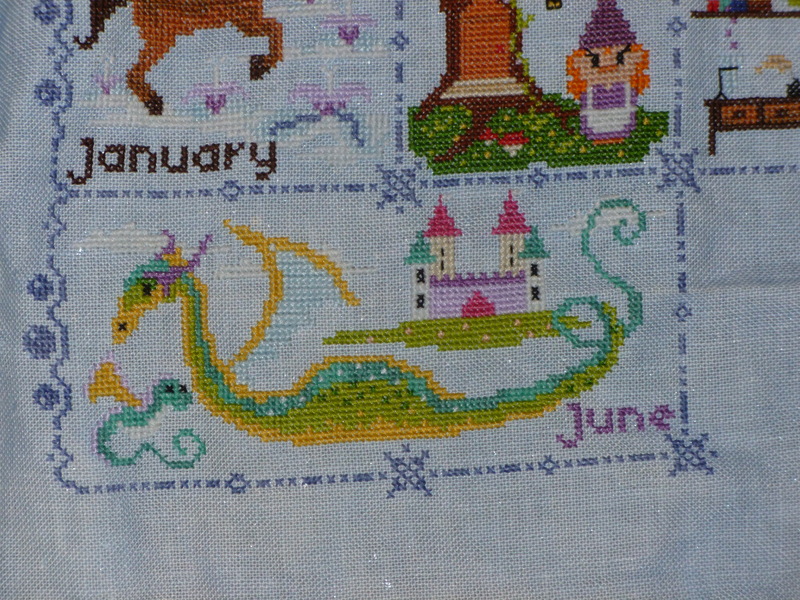 It includes full cross stitch and quarter cross stitch. I don’t like quarter stitch just because my brain likes to shut down while I’m stitching, and when I use linen or evenweave sometimes quarter stitches throw my count off. I also have a tendency to put the quarter stitch in the complete wrong direction. 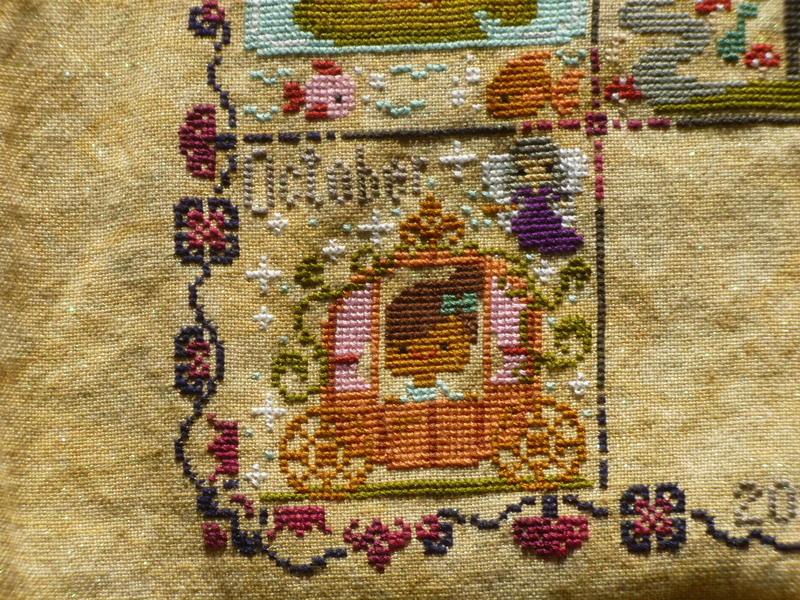 If you’re using aida, for each quarter stitch you’ll need to pierce the little square between stitches; I prefer to do that with a sharper needle than the tapestry needles I usually use. Then again, I avoid aida like the plague because I’m a fabric snob, so it doesn’t come up much. Another thing for beginners to consider, usually you start a pattern in the center, but unless you rearrange all of the blocks of this pattern you’ll need to start in the top left corner. 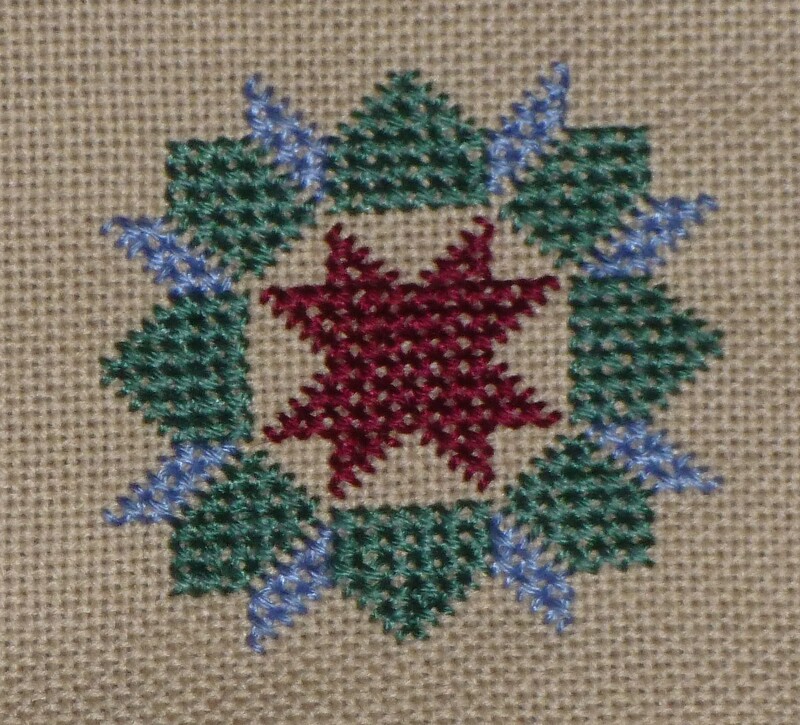 The pattern is about 10×10 inches. To find my starting point, I folded the fabric in half twice to find the center, then measured over and up about five inches (when I say “measured” and “five inches,” I mean I folded a piece of letter paper in half and used that to eyeball 5.5 inches over and up). I called that the top left corner of the pattern, then counted down four stitches and right three stitches for my starting point (leftmost green stitch in the top row, starting in the left bottom corner of the stitch). 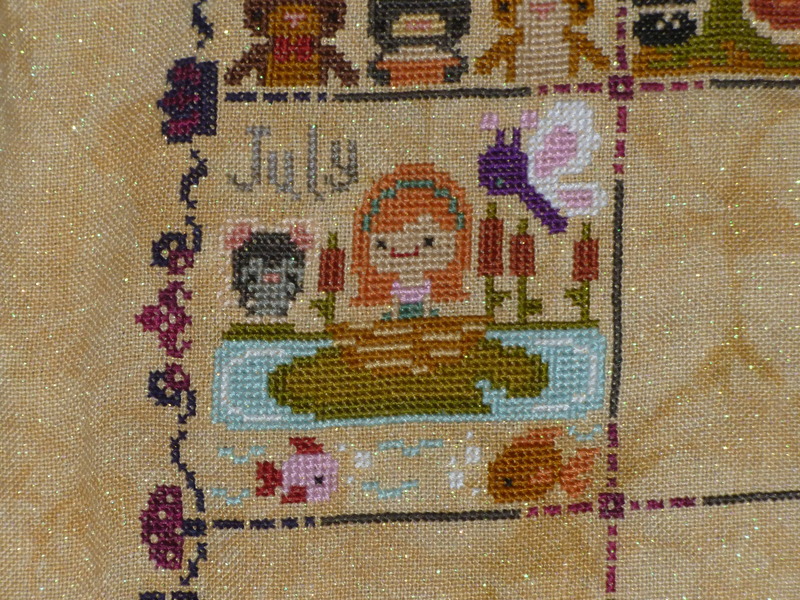 Final note for newbies is that the chart does not look like most other cross stitch charts (grid filled with little symbols). It might be easier to print off the chart and color in the different blocks. A few months ago, when I fussing about how so many cross stitch patterns are either overly cutesy or photos run through cross stitch software, I got the idea in my head that I really wanted to stitch something based on quilt blocks. Of course, I’m not a quilter, and I couldn’t figure out how to build the patterns on my own. And then I found this! Woohoo! 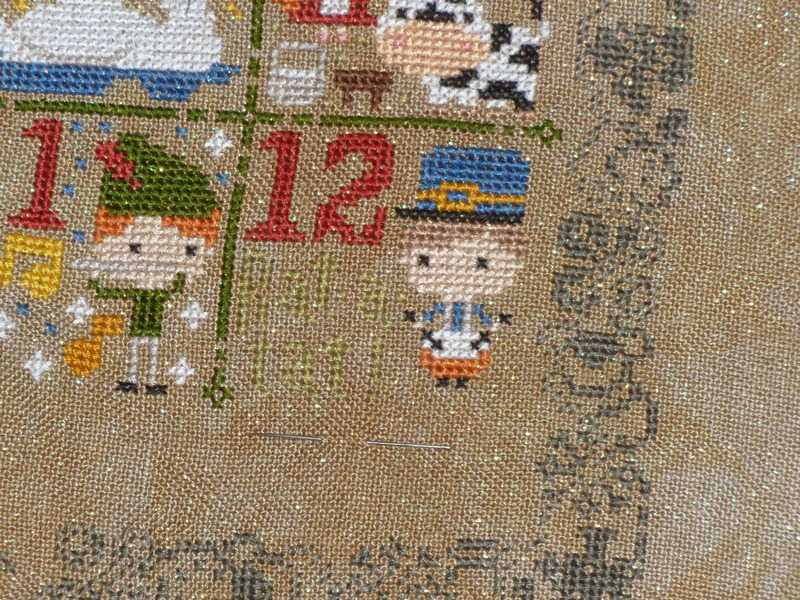 I was hoping by now I could have reported successful completion of the 12 Days of Christmas sampler. I thought, surely if I apply myself I can finish it up. But I didn’t. I’ve been a little distracted the last few days. Was that there when you moved in? We’ve yet to determine how they feel about the colorful bits of string flitting about while I’m stitching, so hopefully I can get back on track. 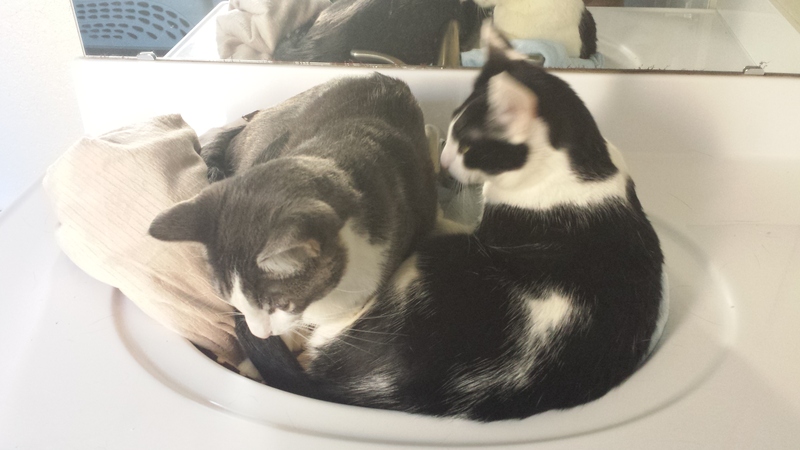 They’ve successfully venture out of the bathroom and taken over the rest of the apartment. The shy one (the gorgeous gray and white dude on the left) has finally left the smaller bedroom and is lounging in a lovely patch of sunlight. The decidedly less shy one has been kind enough not to sit on the keyboard yet, instead opting for the carpet behind my desk chair. I have yet to find any misplaced poops, and while they use my cabinets to stretch, they don’t scratch them. Sweetest lumps of fluff you could imagine. They’ve been either at a shelter or a foster home since they were about a month old, and I can’t believe no one took them home before now. Sadly, they’ve outgrown the itty bitty kitty committee just enough that no one who goes in thinking, “I want a kitten!” would give them a second look. Also, because the gray one is so redonkulously shy they had to go as a pair. BUT that’s not to say I didn’t accomplish anything. I just haven’t accomplished anything since they showed up. 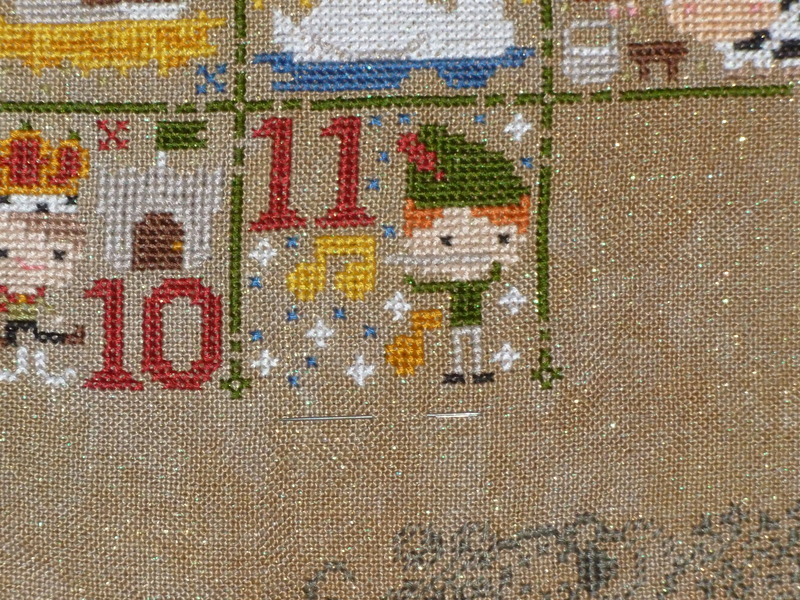 I did make some substantial progress on 12 Days. I finished all the blocks and the titling, and now I just have to finish the border. That border is no joke. I did half of it before the Pumpkins released the rest of the pattern, and it took me a solid 15 hours. Ouch. The second half has been going faster, but it’s still going to take time. 12 drummers drumming. You can’t really read it, but there’s green text with “rat-a-tat” under the 12. Ever so much fun! 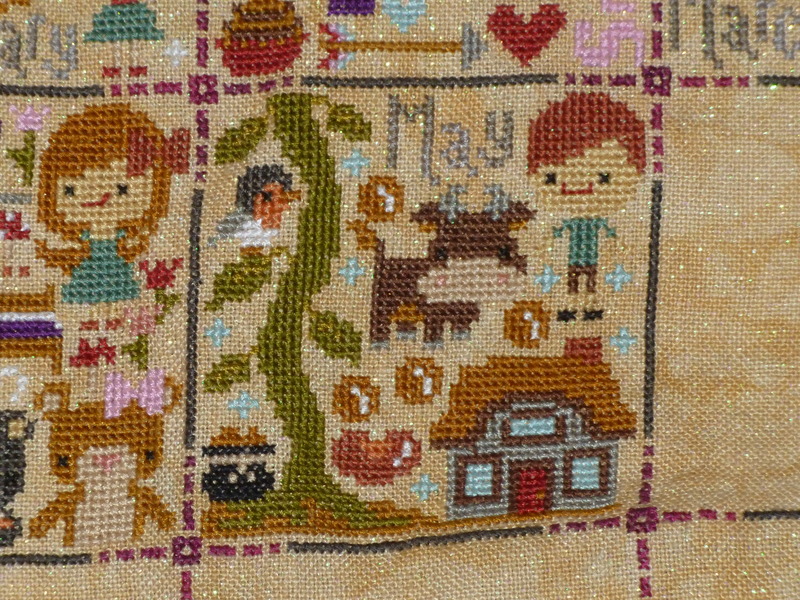 I have to say, my favorite part of the whole pattern is the cow right above block 12. Now if you’ll excuse me, I have to go clean cat fur out of my bathtub.